Paria Springs Trinidad and Tobago Adventures: Ever seen a frog croak? Adventures in Trinidad and Tobago with Paria Springs Eco Community and Courtenay Rooks, naturalist, adventurer, birder, mountain biker, kayaker, surfer and much more. xlpharmacy on Ever seen a frog croak? Ever seen a frog croak? Today while kayaking the mouth of the Marianne River with a wonderful couple; Greta and Dave from Washington state, we heard a strange grunting sound. We investgated and saw splashing near the bank of the river, I got excited thinking it may be a river otter, which is extremely rare, but what I got was my third installment in timeless battle between predator and prey. This time the snake has obviously caught the frog while it was in the river near the bank. Prey calls repeatedly in a death cry puffing itself up to make it too large to eat as predator drags it into branches. The predator's grip is strong, in the photo you can see its teeth sunk into the frog's skin but the frog will not give up. I enter the frey for a desire of modern man; to get the photo. 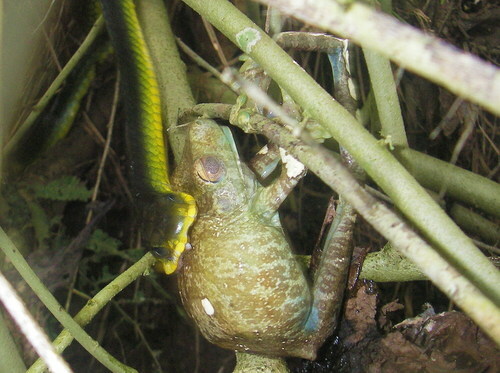 The predator hesitates for a moment and the frog cheats death in a splash, the snake beats a digusted retreat. Snake 1 - Frog 2. Why I have been priviledged to see the epic battle three times I have no clue. I am both elated that I got the shot but disgsted that I interfered. I would love to see this truggle continue. I love that photo. The poor frog looks stiff from all the air it sucked in. Do the frog's legs get stiff too when it's bloated like that? That is the real spirit! Keep it going. Pour snake, see its defeat makes me so sad! damn..frog.